1. Pour all but 1 Tbsp. of the broth into a large stockpot and submerge the 2 bags of rice and cook per the instructions (most say to cook for 8 min. once water is boiling). Drain. Set aside in large bowl. 2. Place 2 Tbsp. of olive oil in a saute pan and once heated place cubed chicken in and cook until browned (3-4 min per side). Cut the turkey kielbasa into 1/2 inch circles and add to the pan and brown. Add shrimp and heat as well (optional). 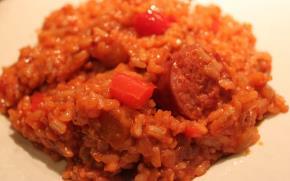 Remove cooked meat from the saute pan with a slotted spoon and add to the rice. 3. Add 1 Tbsp. of olive oil to the saute pan and deglaze it. When oil is heated add diced onion and cook until soft. Add garlic and cook until fragrant. Add salt and pepper to taste. If you like your jambalaya a bit spicy, add a dash of red pepper flakes, Sriracha Hot Chili sauce (a few squirts), and a dash of paprika. Add diced red pepper to the pan and cook for a few minutes more. Add 1 Tbsp. tomato paste and the reserved 1 Tbsp. of broth to the saute pan. Stir together and cook until slightly thickened, 2-4 min. 4. Pour the cooked onion and pepper mixture over the rice and cooked meat, and add 1 cup of Kraft Catalina Dressing. Mix together and enjoy!